Plant rhizomes in spring after last frost date in organically rich, medium moisture, well-drained soils in full sun to part shade (some other species of Curcuma prefer part shade). Plants do well in hot summer with high humidity. Provide regular moisture throughout the growing season and do not allow soils to dry out. Winter hardy to USDA Zones 8-10. 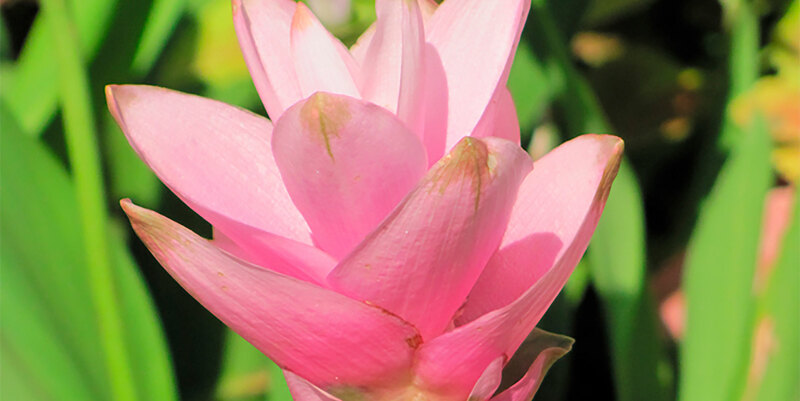 The Siam Tulip or Thai Ginger Lily is a part of the very diverse ginger family (Zingiberaceae), home to over 1300 species, including the edible ginger we all love for it's spicy flavor (Curcuma longa (turmeric), the main ingredient in curry powder). It is a rhizomatous tropical perennial that grows to 2’ tall. It is native to Thailand (formerly known as Siam). Inflorescences, stems and leaves of this plant resemble the flower, stem and leaves of tulips, hence the common name. Siam Tulip is a repeat bloomer that produces abundant inflorescences in late summer through fall. Plants go dormant in winter (first frost-last frost). Each inflorescence (to 3” tall) consists of showy, petal-like, pink bracts that surround the tiny, lavender-white, true flowers. The true flowers are seen only if they curl around the bracts edges. Each inflorescence appears atop a rigid, reed-like stem that grows from a clump of narrow, lance-shaped, dark green leaves. We found this little jewel while out and about hunting for something different, and are so excited to try it out here in our neck of the woods. The above picture, recently taken in one of our client's gardens, clearly illustrates the similarity to a tulip flower's bell shape and long, narrow leaves. What was exciting to us about this particular variety was that unlike others gingers that we see in the landscape in the Dallas area that prefer the shade, the Thai Ginger Lily likes the full sun. It also has a long growing season, blooming showy bright pink (it also comes in a white variety) flowers throughout summer and fall. These elegant blooms each last up to a month. This is our first summer to try the Thai Ginger Lily and we're anxious to see how well it lasts through our winter. If all goes well, the plant should go dormant through the coldest parts of winter and reemerge next summer. However, as we all know the winters in Dallas can be a bit unpredictable, so as long as we are not too wet and too cold we should see this beauty next summer!